The essence of our culture , the taste of our land. In every project we dedicate our entire strength of work to achieve our goals. Our Staff constitutes a big family with commitment and dedication principles. We study all the details and contribute a different point of view to the entire process of sale. We share resources and capabilities with partners specialized in other branch in order to profit the knowledge of our colleagues and improve the competitive position. We adjust our working method to the needs of our clients and the requirements of the market. We orientate our goals to the satisfaction of our clients’ needs, accomplishing with them requirements and expectative. Envíenos un email y le atenderemos inmediatamente. Estamos esperando sus sugerencias. (Expte. 0215SCA243) - "PLAN DE INNOVACIÓN ESTRATÉGICO ORGANIZATIVO" - funded by JCCM y FEDER. C/. Poeta Gª Carbonell, 8 - Bajo. Maskitto Light WordPress Theme by Shufflehound. 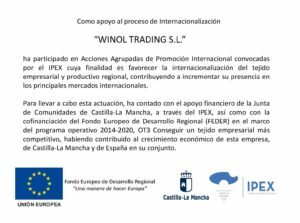 Bodegaswinol.com 2016. All rights reserved.